It’s no secret that my favorite beauty product is Stila’s Stay All Day liquid foundation. I have been using it for a few months now, and I am just as happy with it as the day I first applied it. That initial 1-ounce bottle lasted through countless days of coverage, but finally needed to be replaced last month. Since I am now a loyal Stila user, I decided to make my purchase online through the company and take advantage of the “ample samples” they provide on orders more than $50. Knowing how well the foundation has worked for me, I wanted to experiment with the 5-piece skincare try-me set they were sending with my purchase. After a few days of anxious waiting, my order arrived. That night I tried the Stila skincare line. First up – the Coming Clean revitalizing cleanser. The silky gel had a botanical, minty aroma. It left my skin tingling and feeling soft and clean. Next was the Undercover, a conditioning toner and moisture prep. My skin tends to become dry, but I have been using the Undercover every night after the cleanser and so far, so good. Finally, the Light Source. This serum is great for discoloration and acne scars and the perfect finish to my skincare routine. The sample pack also includes Glowing Reviews, a skin renewing scrub, and Face the Day, a multi-use moisturizer. I have used the scrub a few times after the Coming Clean cleanser; it has a nice texture, and it does not irritate my skin like some scrubs have in the past. My favorite of the products is the Coming Clean cleanser. It’s gentle enough for sensitive skin and smells so good that I actually look forward to washing my face! Recently, I decided to expand my Stila family of make-up products. 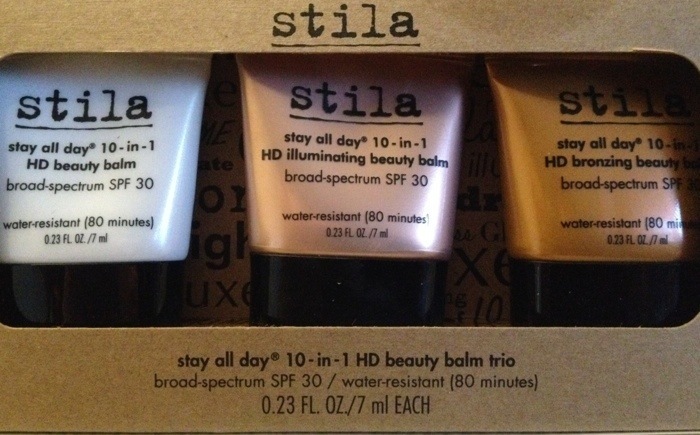 I purchased sample sizes containing three of Stila’s Stay All Day 10-in-1 HD beauty balms. I have never been a big fan of BB or CC creams, but something about a lightweight, water-resistant balm with SPF 30 made me want to give it a try for the warmer months ahead. So far, the HD beauty balm is my must-have on days when I don’t want to apply a lot of make-up. It offers just the right amount of color and coverage to get away with wearing it alone, or pairing it under your foundation for a flawless finish. The Illuminating Balm was a close second, although I found the coverage and color too light to wear alone for my skin tone. Initially, I thought the Bronzing Balm would be my preferred choice and give me a nice summer glow, but it is too dark for my skin. Overall, Stila is my go-to for make-up products… and skincare. Note: To read more about Stila’s Stay All Day liquid foundation, check out my post from February 14, 2014! *Stay tuned for upcoming posts from my adventures at Long Island Restaurant Week (April 27 – May 4, 2014).